After 18 years of prevarication, Gordon Brown has committed to delivering Crossrail for Londoners. In Scotland, ‘Wee Eck’ has promised his SNP administration will build the badly needed high-speed rail link between Edinburgh and Glasgow. At the next General Election, what should Conservatives be offering rail passengers? Britain’s railways are almost at capacity. More passengers are now travelling by train than at any time since 1946. Despite over-crowding, steep fare rises and saturation on many lines, passenger numbers are growing faster here than in any other European country. Growth in demand shows now signs of abating; Government predicts a 25% increase in passengers by 2014, but more realistic estimates are closer to 40%. In its five-year plan for rail announced in July, the Government took the easy option of attempting to choke demand through steeply increasing fares, rather than addressing the urgent need for new lines in helping meet greater capacity. Track-building will be limited to tackling a few bottle-necks and small increases in capacity achieved through adding carriages to some of the busiest trains. Our transport infrastructure is now woefully inadequate after decades of such under-investment by governments of both parties. This negligence has made our lives miserable through ever longer and more uncomfortable commutes. A considerable economic price is also being paid for these failures. This includes further exacerbation of the gulf between turbo-capitalist London and the many parts of the country sustained by near Soviet levels of public spending. "The UK is the only nation in the EU with such marked difference in economic performance between its capital and other major cities…Transport is a key enabler of economic growth, and there are strong arguments for using infrastructure investment on inter-urban routes to spread the benefit and burden of growth." Gummer and Goldsmith’s recommendations on car use may have been unrealistic and damaging. However they are surely right in concluding there is an urgent need to enhance capacity on key rail corridors to accommodate substantial additional passenger growth. After winning power, they recommend Conservatives develop high speed rail links between North and South after a thorough but rapid review of priority destinations and suitable technologies. It currently takes around 5 hours to travel from London to Glasgow, and 2.5 hours from London to Leeds. 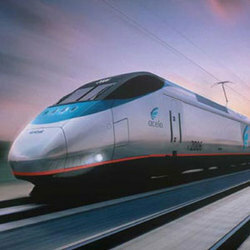 High speed rail could reduce these journey times to 2.75 hours and 1.5 hours respectively. The economic case is compelling. Excellent transport links from the north of England and Scotland to London would slow the relentless brain drain towards the capital. Many workers have to visit London regularly on business. A modern north-south link would encourage large numbers to base themselves further from London to take advantage of lower house prices and a higher quality of life. Wealth and prosperity would be better spread. The environmental benefits would be enormous. Starting to decouple economic growth from transport emissions will be vital if David Cameron’s aspirations for ‘green growth’ are to be realised. Many of us would be happily swap our cheap flights to Scotland for fast and more comfortable trains. Rail freight increased 60% between 1995-2005, and significant increases in track capacity will prevent our motorways becoming further clogged with large trucks. The Conservative Party is the only party that can deliver the high-speed north-south rail links that are so urgently needed. Labour has kicked the matter into touch, refusing to take a decision before 2012. We must be bolder. Championing these links would not only be right on economic and environmental grounds; the political dividends for our party could be great. What could better demonstrate the Conservative Party’s commitment to increase prosperity across the whole country? England and Scotland would be brought closer together, strengthening the Union. There is, of course, the thorny issue of how a new Government would pay for this huge investment. I am no expert on the financing of large infrastructure projects. Yesterday The Times signalled its confidence that significant private money will be available to help given appropriate incentives, a stable planning framework and sufficient political will. By providing the will the Government clearly lacks, David Cameron and Theresa Villiers may be able to deliver the rail network Britain needs to remain competitive and united. This may be the single best idea I've seen posted on Conhome - and I don't live anywhere near the North! Its an idea that combines our focus on environmentalism with something which would strongly support business, whilst alos being a policy which would be extremely saleable to the electorate. The only question is, could we make the sums add up? Excellent idea. Something specific to demonstrate Tory belief in the Union. .. But make it a genuine dedicated new line, with imaginative architecture, fast-track [!) planning & land purchase and direct transition onto Eurostar lines, rather than cobble together something over crowded existing lines , causing interminable disruption to present services during construction. A £100billion over ten years must surely be affordable for the massive wider tangible and intangible benefits. Cancelling ID card scheme would represent an initial deposit. How can you say something makes economic sense without knowing how much it will cost? Crossrail is currently estimated to cost £16bn. The rail capacity expansion just announced by the government will cost £10bn. How much for totally new, high-spec, high-speed track linking London, Glasgow, Edinburgh, Manchester, Birmingham, Sheffield, Newcastle, and Leeds? This is a good policy. We should have been the ones who pushed for the Glasgow-Edinburgh rail link too. The SNP have a good, popular policy there. Strongly agree, go for it in really big style. Tony - It's a fair point that I haven't discussed numbers as far as the potential costs and benefits of a new link are concerned. I also accept that rail is getting much more costly than it used to be. However surely much of the inflation in costs is due to to the Government's ineptitude in procurement and management of contracts, perhaps most notably in the West-Coast mainline. Surely there is going to need to be significant increases in both air and rail travel in the coming decades in our economy is to grow. Predicting the economic benefits of large projects such as Crossrail and the north-south rail link involves much educated guesswork. I reckon we need much better road and rail links to the north and Scotland if their eceominies are ever to start catching up with the south. This came up at a number of fringe events at conference, and it's the most significant inhibitor on the economies of regional cities. Consensus on this issue will surely be forthcoming. Speaking on behalf of Leeds, the hour that could be saved on the journey time is significant, but the bigger barrier is cost. A standard class return ticket, Leeds to London, with no concessions and not bought well in advance (because sometimes you can't plan ahead) costs in the region of £175. That makes a quick trip to London impossible for the vast majority of people. I simply cannot express enough my agreement with this excellent little piece. In fact it's the same sentiment I've been boring people with over dinner for a year. I would just like to add that high Speed Rail links could mean that small airports in Northern England could be expanded to become large scale international terminals, rather than Gatwick and Heathrow, further spreading prosperity and reducing expansion in London where space is at a premium. We are committed to sticking to Labour's spending plans for the foreseeable future anyway. Why not spend the money on something that will actually benefit Britain for decades if not for a century, rather than useless publicity seeking initiatives. Bugger the cost. Show me where to sign a petition; I will sign it. Suggest someone I should e-mail; I will do it. Congratulations on the article, and please don't let this issue rest here. Cameron - I agree that all transport needs more spending. But other problems with rail - Civil Engineering contractors are now paying skilled manual workers £100 per hour. Around £2.3bn pa of renewals cost is capitalised, whereas pre 1994 it was written off as revenue spending - hence Network Rail's escalating debt and interest costs. The US Dep Sec of Transportation told me "We believe long haul railroad passenger transportation is no longer viable", and Canberra officials, asked about the Sydney - Melbourne rail scheme, echoed Eddington: "WHAT! Spend all that public money to carry tourists and old age pensioners!" Best regards, Tony Lucking. The US Dep Sec of Transportation told me "We believe long haul railroad passenger transportation is no longer viable"
Long-haul in the US refers to a scale of distance that is orders of magnitude beyond anything comparable in the UK. Amtrak actually operates at a profit in the one place its existence is justified by the ridership: the Northeast Corridor from Boston to Washington DC, via New York and Philadelphia. Assuming no maintenance problems (always a big assumption), that's about an 8-hour trip on a standard train, or 6 and a half hours on the Acela so conveniently pictured above. "Long-haul" by contrast would mean something like the Silver Meteor from New York to Miami, or the Sunset Limited from Chicago to Los Angeles, where you're talking days of travel time. There is a marked difference between the quality and speed of trains in the UK and on the continent. The difference between the modern London-Paris Eurostar route and the dated London-Edinbugh route is nothing short of scandalous. Such a policy would tone down the reliance on cheap short haul flights (I am as guilty as many England-based Scots in using Easyjet one hour flights to visit home to avoid a seven hour (delays included) train journey) and really demonstrate and reinforce our Unionist credentials. Britain desperately needs a high speed rail network, which I would support on the understanding it largely follows existing motorways (like much of the Channel Tunnel Rail Link does). This would have the added benefit of highlighting the train's speed (and style) to the motorists it passes at up to 189mph. What's important also is that this railway network is not only for passengers but also for freight. Using a system based on the Channel Tunnel's "Shuttle" service for road vehicles (i.e. where cars/lorries roll on and off the train at terminals) we could remove thousands of lorries from our roads. This would encourage industry and also suit haulage firms as time spent on the train would count as "rest" for drivers, be far faster, use less fuel and cause less wear. We can never beat roads with rail entirely, but if we can get more lorries to drive to a terminal, get on a train and disappear to a terminal nearer their final destination that's a whole lot better. "...the bar chart in the Economist 28 July shows that rail travel per person in the USA averages about 50 Km per annum, vs our 750..."
The shapes of the statistical curves are radically different: most Americans, especially outside the Northeast, have NEVER ridden on a train in their entire lives. I took one from Fort Lauderdale to Jacksonville last month, but then, I grew up in Boston. "It costs about three times as much to move a passenger by rail Euston to Glasgow, as by Ryanair Stansted - Prestwick"
Where does that figure come from? London > Glasgow by train (single) can cost as little as £17.50 (Virgin) or £15.70 (GNER) if you book ahead, or as much as £120 for a standard open single if you need flexibility. Stansted > Prestwick with Ryanair can cost you as little as £10 (1p+tax) if you book ahead or as much as £132 (if you're not flexible and e.g. want to travel this week on Thursday or Friday). Of course, if you're actually in London and want to go to Glasgow (rather than being at Stansted and wanting to go to Prestwick) you'll have to pay to get yourself to the airport (another £14.50 for the Stansted express...) and since Prestwick is 32 miles from Glasgow you'll have to pay to get from there to Glasgow too. "...For the 401.5 mile journey Euston - Glasgow the cost must be nudging £110"
Virgin run a lot of routes - is it fair to assume that Euston > Glasgow is as [un]profitable as all the rest? Could you work out the costs on the GNER route? Virgin pay Network Rail to use the tracks - to what extent does this cover the relevant part of the operating costs of the rail network? Who pays to staff and run the stations along the route? Ryanair pay landing charges - to what extent do they cover the relevant part of the airport's operating costs? If the landing changes don't cover it, who else pays to staff, run and protect the airports? "...And the planning meetings for Eurostar were moved from Central Paris to Charles de Gaulle airport!" CDG has good transport links (including a TGV station) and has plenty of local facilities for meetings/conferences just like Heathrow and Frankfurt/Main. I've been to all three and they have more hotels than you can shake a stick at. re Tory Jim's queries. Chris Green,when boss of BR Intercity, told us at the British Chambers of Commerce that the West Coast route North of Preston was a financial disaster, and it is still poorly utilised. Chris Garnett, former boss GNER, has recommended "de-wiring" North of Newcastle in Rail magazine - ie rail should stick to modest speeds on routes of less than 200 mile. The interest charge per passenger alone if Eddington's £33Bn was spent on "HS2" would be commensurate with Ryanair's total cost! And airport charges yield a profit - even BAA's Stansted has become profitable now. Tony Lucking. Thanks for your response, but you didn't actually manage to answer any of my questions... perhaps you could read through them and try again? "There is another form of cross-subsidy at Stansted: the actual airport operation is loss-making – to the tune of £1.12 per passenger – but car parking, shops and other retailing/commercial activities earn £3.24 per passenger, thus producing net operating profit of £2.12 per passenger..." (Based on accounts 2004-05). Is this claim true or false? If it's true, what do we think of this? Does the Conservative party now support cross-subsidies? re Tory Jim's points. Stansted landing fees have been doubled since his 2004/5 data. I believe GNER's figures are submerged in its parent company's accounts, but we know that paying the Rail Regulator 0.3p per pass-km drove it into financial failure. In addition to Virgin's direct subsidy of 5.9p per pass-km, it emjoyed a share of last year's Government grant of £1893m to Network Rail, and since privatisation, over £2m of track renewal costs per annum have been "buried" by re-labelling it capital expenditure, debt financed, whereas previously it was written off annually as revenue expenditure. Standard return train travel from B'ham to London for a journey (Virgin trains) lasting just over an hour - £154 but a journey from Southampton to London return (SW trains) at the same time of day is a little over £30. Coach travel same journey fares start at £8 to London and £5 back to B'ham. "Standard return train travel from B'ham to London... £154"
This is really not rocket science. It doesn't matter what method of public tranport you choose, heavily discounted fares have substantial restrictions, full price flexible fares are, well, full price and they're flexible. If you book far enough in advance, you can do Birmingham to London and back on Virgin trains for £20 (2 x £10 'value advance' singles). "Coach travel same journey fares start at £8 to London and £5 back to B'ham. Go figure.."
What is there to figure out here? Firstly, how often do you actually travel by coach? Would you honestly recommend this method of transport to a business acquaintance? I'm not being snobby, but if I had to choose between a making that journey by train for £20 or by coach for £13 I'd be on the train. There is also the minor matter of travel times - the train takes 90 minutes, the coach takes three hours.